Pianist Jonathan Biss and the Elias String Quartet are young, intelligent and passionate musicians. Friday night they performed another concert in Biss’s “Schumann: Under the Influence” project to Jordan Hall as part of the Celebrity Series. The Elias Quartet has been around since 1998, when it was formed at the Royal Northern College of Music in Manchester, England, but only made its North American debut last year. The signature of the group is a beautiful, understated tone that makes one reach for multiple synonyms for “luminous,” combined with a crystal clear sense of balance—every note from every player is audible, even when textures get dense. First violinist Sara Bitlloch plays with strength and prominence but doesn’t dominate; the other players, Donald Grant (second violin), Martin Saving (viola) and Marie Bitlloch (cello) never struggle to make their voices heard. Jonathan Biss has made many appearances in Boston, and has already performed a Jordan Hall solo recital this year as part of his Celebrity Series Schumann project. Schumann’s String Quartet in A Minor (Op. 41 No. 1) and Piano Quintet (Op. 44) were backbones of the thoughtful and illuminating program, also interleaving much older music by Henry Purcell and something almost brand new from Timothy Andres. The Elias opened the evening with three Fantasias by Purcell originally written in 1680 for viol ensemble and arranged for string quartet. Each Fantasia is relatively brief and is made up has three or four subsections, each in a different tempo. Each section explores a brief melody or gesture, usually quasi-fugal in nature, where each voice enters individually, although there are episodes where the parts move together before divagating on their own paths. This was an unusual curtain opener, and a fascinating one. There’s a liveliness to Purcell’s polyphony which never seems academic despite its complexity. Often voices enter right on each other’s heels; a kind of perpetual stretto, giving a sense of falling headlong into the music. The harmony of each subsection seems static, until sudden dissonances crash through and then immediately evaporate, producing flashes of emotional extremity on an otherwise placid surface. For these pieces he Elias played without vibrato, but not without full attention to the emotional possibilities. Skillful use of dynamic and attack brought out the drama inherent in each voice. The balance was excellent; you could clearly hear each line as you moved your mental focus from instrument to instrument. The Purcell was a surprisingly appropriate introduction to the opening of the next piece, Schumann’s String Quartet in A Minor, Op. 41, No. 1. Written while the composer was immersed in studies of counterpoint, it opens with a strictly imitative adagio that sounds like it comes from the world we inhabited with the Purcell. The music slowly unfolds, gaining new expressive possibilities and by the end of the introduction we were in 1842. The quartet began at a hushed, almost hesitating dynamic, as if reaching back to find its connection to the older music, then gaining strength. 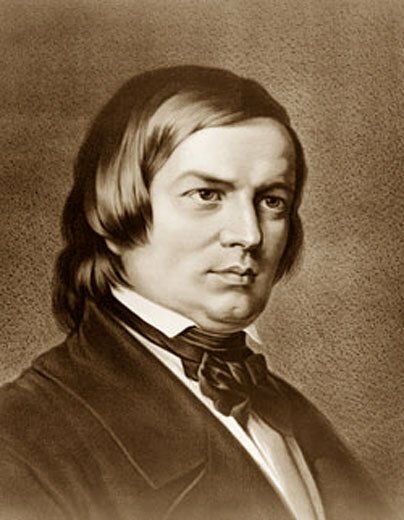 The work shows Schumann trying to work in the scale and structure of the great classical composers, Beethoven especially, with interesting results. The traditional structures contain idiosyncratic music. The second movement scherzo sounds like angry Mendelssohn; the finale is a busy sixteenth-note piece of business that suddenly turns into a hurdy-gurdy before becoming an ethereal chorale, only to end with an almost Rossini-esque flourish. But the heart of the piece is the third movement Adagio, which alternates 16th-note outbursts and a long melody with a longing chromatic ache in the middle, which sounded written to show the Elias at its best. Timothy Andres is a young (born in 1985) Brooklyn-based composer who already has an impressive list of commissions and performances. His Piano Quintet from 2012 is a thought-experiment—what if Schumann had written his piano quintet not in the shadow of Beethoven, but rather as a collection of the miniatures at which he excelled? Andres’s work is a collection of five movements played without pause, based on fragments of Schumann from the Opus 12 Fantasy Pieces. The first movement, “Canons and Fables” is a prolation (or mensuration) canon, where a subject is played against itself at varying rates of speed, which in this case resulted in a texture filled with suspensions and echoes. The canon eventually chases itself into a static corner, out of which comes the music for “Boulder Pushing”, where tremolos in the instruments eventually gather enough momentum to throw the piece into a new musical space. The next three movements, “Teneramente”, “Lenticular Postcard” and “Pyramid Scheme” stand separate from the first two, with a slower sense of movement, a darker overall sound, and a loss of forward momentum. The piece doesn’t end so much as cease, and I felt as though I lost the argument of the music along the way. The Andres Quintet took the Schumann Quintet as its inspiration, as confirmed the feeling the Schumann pieces was the ultimate goal of this evening. Biss has written eloquently about his particular deep connection to Schumann, which I must assume the Elias String Quartet shares, as this performance was full of love and attention. The players had an especially affecting way with Schumann’s slow music. Biss provided a foundation that brought depth and grandeur to the music, and the Elias brought its glowing clarity and beauty of tone. I have one cavil, which is that Schumann’s occasional outbursts and strange transitions were ironed out, drained a little of their uniqueness. This was an evening of intelligent music making that was particularly fine-grained, as if each phrase has a thought and a decision behind it. Perhaps it is also betrayed a sense of reserve, conveying the feeling that some dimension of emotion is held slightly in check so that fine distinctions could be heard. Biss is determined in his writing to dispense with the stereotype of Schumann as madman, and perhaps that can be heard in the interpretations, which, while passionately felt, were a bit understated. As consequence of that plausible view, the players favored intimacy and thoughtfulness over drama. I attended Jonathan Biss’s master class at NEC March 13th. Within the two and a half hours that Biss generously gave the session, my memory centers indelibly on the first four of Schumann’s Op. 12 Fantasiestücke. How gently yet firmly Biss lent his own intense artistry to the young student’s estimable forays! Biss’s coils and twists were utterly gymnastic, now weaving behind the pianist, unseen by him, to coax the molding of each unfolding line, now digging with fingers outstretched to lure a phrase to rise, Erda-like, from the roiling Schumann deep. But the young student-pianist could catch the imploring voice. He could feel the breeze of its urgent solicitude and moved closer to Schumann than ever he’d been before. So had I.
I was very happy to see that some music by Purcell appeared on this otherwise standard Romantic- and contemporary-era program, but I was less happy to read that the Elias played the Purcell Fantasias “without vibrato.” The major question is: “why?” If the quartet eschewed vibrato simply because they liked the sound, that is great and no further comment is needed. However, if they were using this performance practice technique because they felt they “should,” in order to appear or sound more historically correct, that is sad. On purely historical grounds, there is no evidence to support the claim that the music of Purcell or any other composer from this period was performed without vibrato; on the contrary, there are documents that lead to the conclusion that vibrato was an accepted means of creating color and dynamics in 17th-centry England, just as it has been used throughout the centuries and in many national styles. I am greatly pleased to see that modern-instrument ensembles are finally dipping their toes back into the early-music repertory after being told for so many decades by so-called early music specialists and their record companies that they can’t or shouldn’t play this music, since they will always do it “wrong” (the very word should raise a red flag, since it has no place in describing artistic creation). However, I am less than pleased that they have bought into this post 1960-orthodoxy of historical performance, even though much of it is based more on socio-economic factors than on historical fact. I know, I know–I have said all of this before, but it sometimes bears repeating. So, gentle readers and listeners (and performers): caveat emptor! I love Mr. Kroll’s comment and am in complete agreement. As a player with one foot firmly in the so-called ‘period’ world and the other in the ‘modern’, I tire of the lines drawn in the sand over the vibrato question – and questions of style, in general. There is room for performances of the St. Matthew Passion from the Chicago Symphony as well as the Cambridge Concentus – not to mention everything in between! Beautiful performances transcend discussions of style and ‘authenticity’ and should be judged as such. Henry Hoover’s comment is poetic. Just to note, the student performer referred to here was a woman, Yoko Fukumura.